Prime minister Narendra Modi has called a high-level emergency meeting on Saturday to review the health of the economy in view of free-falling rupee and surging oil prices which have come in for severe criticism from many quarters. The meeting will explore intervention measures to tame the slide in rupee’s exchange value which touched threatened to breach 73 a dollar on Wednesday. Finance minister Arun Jaitley and Reserve Bank governor Urjit Patel and senior government officials will attend the meeting. Issuing NRI bonds, a hike in interest rates by the central bank and greater role for the RBI in forex market to support the domestic currency are some of the top items on the agenda of the all-important meeting. The need of NRI bond, its size and timing of its issuance are expected come up for deliberations. Official sources said the prime minister wants to the local currency to level at its own value which is indicated at Rs 70 a dollar. Three measures that hold key to the meeting will be presented by the Department of Economic Affairs along side inputs and suggestions from the Reserve Bank and the Department of Financial Services. The meeting would also discuss the oil price hike in the country following surge in crude prices globally. A senior government official said the shortage of oil created by OPEC is 'not real' He also said the government is committed to meeting the fiscal deficit target. It is important that India does not end up with twin deficits, therefore, the government will hold back on excise duty cut for now. Pressure is already mounting on the RBI to take stronger actions to stem the currency's slide. The central bank has already raised interest rates twice since June and has depleted billions of dollars to bolster the currency, but with little success. Trade deficit for August stood at $17.40 billion, down from $18.02 billion a month ago. The rupee has been under stress on account of widening current account deficit and implications of worsening trade war between the US and China. The CAD stood at $15.8 billion or 2.4 per cent of the GDP in the first quarter of the current fiscal. Moody's has forecast that India's CAD will touch 2.5 per cent of the GDP in FY19 on the back of rising crude oil prices which has further been accentuated by falling rupee. 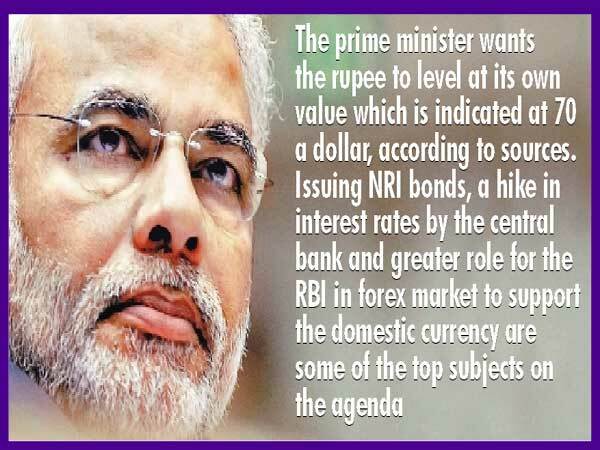 The RBI intervenes regularly in the foreign exchange market to smooth volatility. The intervention has taken a toll on forex reserves. From a record $426 billion in mid-April, reserves have fallen to $400 billion in August — enough to cover eight months of imports. The RBI which targets inflation control with raising rates will now try to check the rupee’s decline with higher rates, said sources. The RBI raised its benchmark rate to a two-year high of 6.5 per cent last month and may follow through with more policy tightening.